Video clip synopsis – Prime Minister William Morris (Billy) Hughes' Conscription Referendum failed twice, in 1916 and 1917. Broadband MP4 conscription_bb.mp4 (7.5MB), suitable for iPods and computer downloads. World War 1 and the Conscription Referenda is an excerpt from the film Cavalcade of Australia 1901-1951 (34 mins), produced in 1951. Cavalcade of Australia 1901-1951 was produced by the Department of the Interior. On completion of this unit the student should be able to analyse, either orally or in writing, how a selected text constructs meaning, conveys ideas and values, and is open to a range of interpretations. On completion of this unit the student should be able to draw on ideas and/or arguments suggested by a chosen context to create written texts for a specified audience and purpose; and to discuss and analyse in writing their decisions about form, purpose, language audience and context. In 1916 the Australian Government, under Prime Minister William Morris (Billy) Hughes, called for conscription of Australian men to supply replacements for the casualties; voluntary recruiting did not seem to be producing sufficient numbers to supply the front line. Hughes held a referendum in which the people of Australia had to indicate whether they supported or opposed conscription. The referendum caused great divisions in Australian society and within Hughes’ own governing Australian Labor Party. In 1917 Hughes, who by this time had been expelled from the Labor Party and was now the leader of the Nationalist Party, a combination of the pro-conscription Laborites, and the Liberal Party, held a second referendum in 1917. A slightly increased majority rejected the proposal, but with great social hostility and disruption being caused by the issue. The war ended in late 1918, but by 1919 a shortage of transport ships meant that many Australian troops were still waiting to be returned to Australia. Describe your image of Australian troops in the war known as ‘The Great War’ and their involvement in the battles fought on the Western Front (the border area between France and Belgium) between 1916 and 1918? List the texts that you have seen and heard that may have contributed to this image. 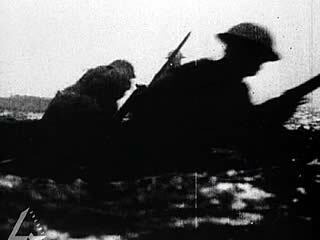 Describe the image this video clip portrays as an image of World War 1. Write an analysis of the video clip discussing how the filmmaker has used cinematic techniques including camera shots, voice-over narration, music and editing to portray the image of World War 1 that it does. Conscription (compulsory enlistment of men for military service) was a very passionate and divisive issue in Australian society in 1916 and again in 1917. a) How does the video clip present the issue? Is the video clip pro-conscription, anti-conscription or neutral? Give reasons for your answer. Do you think that the video clip is a similar representation of war, one that has ‘sanitised’ the experience? Give reasons for your answer. Look at an ANZAC Day commemoration in your community. What is the image of war that ANZAC Day presents? What is stressed and what is minimised or excluded? The Western Front has been presented in poetry by Wilfred Owen and other World War1 poets. Create and present an oral presentation comparing some of the poetry with the image of war presented in this video clip. Write a brief reflection on your oral presentation that includes your messages, audience and purpose.